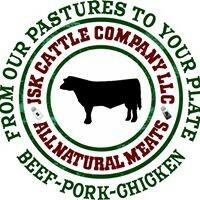 What makes our beef different from what you get in the store? Our beef is all natural. We do not use antibiotics or hormones in our animal. Our beef is pasture-raised. We do not confine our steers to finish them out; they spend their lifetime grazing our pastures the way they were intended. For our grain fed group, a small amount of grain is supplemented to achieve the right degree of marbling and ensure a pleasant eating experience. During the winter months, the cattle continue to browse the pastures and are supplemented with locally grown hay. Our animals are raised sustainably. All of the nutrients from the manure are recycled back into the soil. The cattle do the majority of the work, spreading nutrients for the next crop of grass as they graze. Manure from winter feeding areas is also spread back on the pastures. Our beef is fresh. Our animals are brought directly from the farm to the butcher, who will custom cut the beef to our/your specifications. The meat is then brought back to the farm for you to pick up.